The menus in Photoshop Elements are logically constructed and identified to provide commands for working with your pictures. The menus include many commands that you don’t find supported in tools and on panels. Photoshop Elements (Mac only): On the Macintosh, you find the Photoshop Elements menu preceding the File menu. This menu provides the Quit command used to exit Elements, and it provides access to Edit Full Preferences. File: The File menu contains commands for working with your picture as a file. You find commands on the menu for saving, opening, processing, importing, exporting, and printing. Edit: The old-fashioned Copy, Cut, and Paste commands are located on this menu. Additionally, you have some important application settings commands on the menu, including Preferences (Windows). Image: You use the Image menu most often when you want to effect changes to the entire image, such as changing a color mode or cropping, rotating, and resizing the image. Enhance: This is where you go to change the appearance of an image, such as changing its brightness and contrast, adjusting its color and lighting, and doing some other smart fix-up work to improve its appearance. 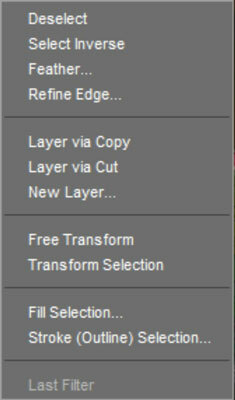 Layer: Most kinds of editing you do in Elements are best handled by using layers. Elements neatly tucks away most of the relevant commands associated with working in layers right in this menu. Select: Whereas the Image menu contains commands that are applied to the entire image, you can edit isolated areas of an image by using the commands on the Select menu. To isolate an area, you need to create a selection. This menu contains commands to help you with many essential tasks related to working with selections. Filter: The Filter menu is where you find some professional photographic darkroom techniques, or you can completely leave the world of photography and explore the world of a fine artist. With tons of different filter commands, you can create some extraordinary effects. View: Zooming in and out of images, turning on a grid, exposing horizontal and vertical rulers, adding annotations, and checking out the print sizes of your pictures are handled on the View menu. Window: Elements has so many panels that keeping them all open at one time is impractical. Thanks to the Window menu, you can easily view and hide panels, reopen the Welcome window, tile and cascade open windows, and bring inactive windows to the foreground. Help: The Help menu offers interactive help information and links to the Adobe Web site for more information and a little assistance, courtesy of the tutorials accessible from this menu. Contextual menus are those little menus that appear when you right-click or Control-click on a Mac with a one-button mouse, offering commands and tools related to whatever area or tool you right-clicked. The contextual menus are your solution when you may be in doubt about where to find a command on a menu. You just right-click an item, and a contextual menu opens. Before you become familiar with Photoshop Elements and struggle to find a menu command, always try to first open a contextual menu and look for the command you want on that menu. Because contextual menus provide commands respective to the tool you’re using or the object or location you’re clicking, the menu commands change according to the tool or feature you’re using and where you click at the moment you open a contextual menu. For example, the following figure shows the contextual menu that appears after you create a selection marquee and right-click that marquee in the image window. Notice that the commands are all related to selections. A contextual menu for selections.